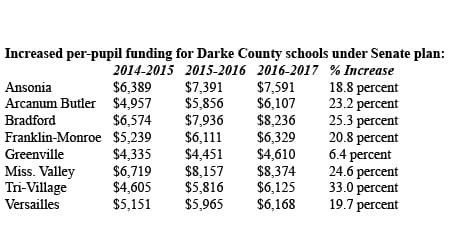 DARKE COUNTY – Public school districts in Darke County may see increases in state funding for the next two years. According to a proposal in the Ohio Senate, contained within the state’s fiscal year 2016-2017 budget bill, Darke County schools would see percentage increases ranging from 6.4 percent to 33 percent. The Senate’s school funding proposal is only conjecture at this stage. It will need to pass muster in that legislative body and then be reconciled with the House version. After that, the bill goes to Governor Kasich’s desk. The Senate has until July 1 to send its revisions back to the Ohio House. Based solely upon the percentages on paper, the big winner appears to be the Tri-Village School District. If passed, the Senate’s proposal shows the school system in New Madison receiving a 33-percent increase versus the 2014-2015 level of funding. On the low end, Greenville City Schools show a 6.4-percent increase for that same time frame. Though some may question if the proposed funding levels are equitable among schools, State Senator and President of the Ohio Senate, Keith Faber, told the Daily Advocate that it is more important for people to look at the per-pupil figures. The senator believes the Senate’s school funding plan takes into account more factors than the version proposed by the House or the governor’s plan. One of the factors is transportation. “Some of Darke County’s school districts have less population density than Greenville’s, therefore their transportation costs are higher,” he said. The Senate plan also offers incentives for higher-performing schools in the state. “Schools may receive more money based upon their graduation rates. We’ve set aside an additional $60 million for that,” Faber added. Further, another $60 million has been earmarked for schools that show sufficient third grade reading scores. “We hope to incentivize certain behaviors we want to see more of,” he said.